What a FUN (and educational) summer we've had! We've gazed at the stars and other celestial beings and traveled to White Sands to enjoy the full moon up close and personal. We have explored our way through Zoology Camp while learning about all the classifications of animals and trekked through the zoo to identify each kind. We've engineered our way through Mean Machines Camp so we could build a Rube Goldberg Machine. We've peeked through our safety goggles at Mad Scientists Camp while decoding secret messages, separating colors with chemicals, and blowing up Diet Coke with Mentos. And we painted, sculpted and splattered our way through Art Appreciation Camp while learning about some famous artists and their unique styles. Until next year, my smart little campers! I think I'm learning more AND possibly having more fun than my smart little campers. :) What a blast we are having this week! So far, we've talked through paper cup and yarn phones (they really work! ), and played with Oobleck (Oh, the fun of a Non-Newtonian Liquid), attempted to decode secret messages using lemon juice and heat but that didn't work (an important lesson in all science experiments), separated the colors in markers with water (seriously cool), discovered that rate IS proportionate to particle size by dissolving antacids, dehydrated cucumbers by using three options of sugar, salt and baking soda, made balloon rockets and paper rockets. All that's left is Explosion Day on Friday! Here's some fun photos of the things we've tried this week. EDIT: Friday was super fun! We put Mentos in Diet Coke and watched it become a geyser! And the, we made our own ice cream by "testing" the difference between just shaking it in a bag of ice, versus shaking it in a bag of ice and salt. Good times. We watched a fun video series about each of the simple machines, plus a hilarious (and educational) video by Bill Nye the Science Guy, enjoyed some books about each kind of machine, looked for them around the center and at home, had intelligent discussions about how they work, and then each day we opened the Mystery Bag to create an engineering masterpiece using the information we had gathered about machines. The students are so smart! They found new ways to make the projects work every single day. I was so impressed. I am no engineer and I'm not ashamed to say I learned a few things this week as well. At the end of the week, we put all our knowledge together to build a Rube Goldberg Machine to push a car down a ramp (inclined plane). The children brainstormed together and designed it themselves, and ended up with a machine that used a pulley, and several inclined planes, including books as dominoes, to push the car down the ramp. Mr. T finished the week of Zoology Camp by learning about birds and fish, reptiles and amphibians, and a day spent on invertebrates, even though the kiddos mostly wanted to talk about bugs. 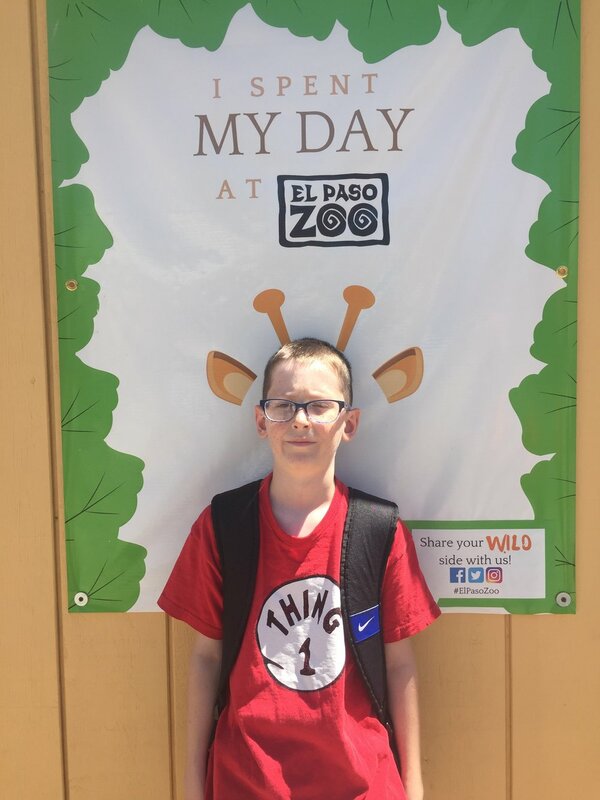 On Friday, everyone packed a lunch and headed to the El Paso Zoo. We had a ball, with most of the parents joining us, too. 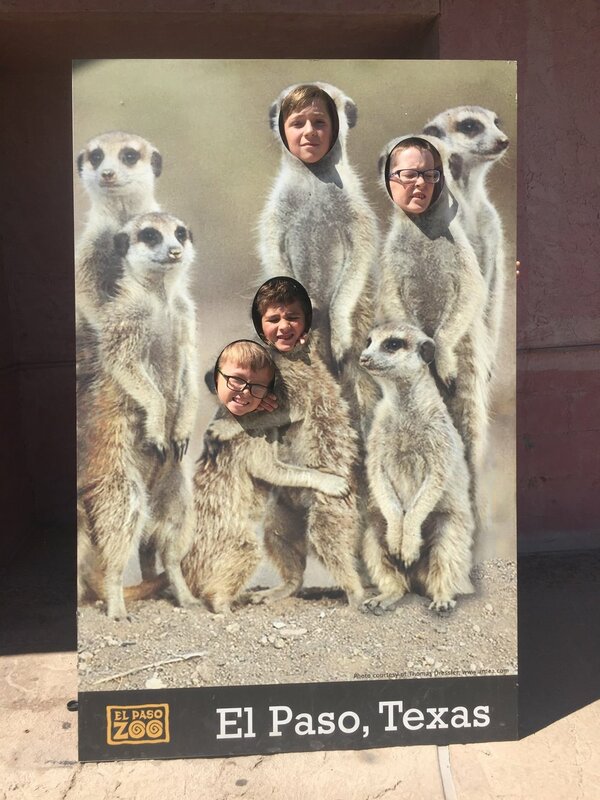 The students enjoyed seeing the animals they'd been studying all week and many others species as well. Mr. T is attending Zoology Camp at LFAL this week and is already enjoying it. (Slick is not attending camp due to gymnastics practice.) Today's lesson was about mammals. Mr. T learned the 6 things way to generally identify a mammal. He enjoyed a word scramble, play dough time, talking about what he already knew about animals and what he wants to learn this week in camp, reading books about animals and playing the monkey-ring-toss game. Mr. T and Slick are excitedly looking forward to Friday since Slick will be joining the rest of the class for a trip to the El Paso Zoo. Fun will be had by all.